Converted from a stable block are two delightful cottages built in traditional honey coloured Cotswold stone, originally a part of an 18th Century Coaching Inn, which was then called The Crown. The stables, were used to accommodate the extra horses required to help pull the coaches up Crickley Hil. The property was bought at the end of the 19th Century by Sir William Thistleton-Dyer who was a director of Kew Gardens. Whether he had renamed it or not we are unsure but at that time it was called &ldquo;The Ferns&rdquo; then Crickley Court and the sloping land at the rear of the house was apparently well looked after and contained many rare and unusual plants. The cottages are situated within this beautiful setting, surrounded by the vast gardens which are very picturesque. Each has its own private garden and there is also a separate children's play area with swings, slide and trampoline. Crickley Court Cottages are situated on the side of Crickley Hill, an area of outstanding natural beauty. We have good links to ALL parts of the Cotswolds via the A417, M5, A46 and A40. We are also very close to Crickley Hill Country Park and also many parts of The Cotswold Way. They are ideally placed to visit the many attractions, villages and towns of the Cotswolds. Dogs are very welcome but for everyone's enjoyment we ask that you do not allow your dog on any furniture or in bedrooms. An additional cleaning fee will be incurred should there be evidence of dogs having been on beds or furniture. We strongly advise you to bring your dog's own bedding with you. Dogs must be booked and paid for in advance. Any dogs arriving without prior arrangement will need to be accommodated elsewhere at your own cost. No dog must be allowed to remain in the cottage when you are absent unless they are happy to rest in their own cage and are unlikely to bark or become distressed. A comprehensive list of walks and dog-friendly pubs is provided within the cottage. Please wash off muddy dogs before entering the cottage by using the outside tap. A dog towel is provided &ndash; guest towels must not be used on dogs. Dogs are welcome to use the garden at the rear of your cottage but must be under supervision always. Special care needs to be taken when a dog is near the lane. Please clean up after your dog. We do not supply doggy bags, but dog waste can be deposited in doggy bags in the wheelie bins by the parking area. Please obey the Countryside Code whilst enjoying the area with your dog. Please keep your dog under close control always for their own safety as well as the comfort of others. Much of the land around Witcombe is farmland and so close control of dogs is required always to ensure that no damage is done to crops and that sheep, horses and cattle are not distressed by the presence of dogs. Two Cooperative Grocery Stores in Brockworth; Abbotswood Road and Court Road - 2 miles;	Tesco Superstore, Gloucester Business Park, Delta Way GL3 4AA &ndash; 3 miles;	Morrisons Superstore, Caernarvon Road, Up Haverley, Cheltenham, GL51 3BW &ndash; 4 miles;	Sainsbury's, Gloucester Barnett Way, Barnwood, Gloucester, GL4 3RT &ndash; 5 miles;	Asda, Gloucester, Bruton Way, Gloucester, GL1 1DS &ndash; 6 miles;	Waitrose, Cheltenham Honeybourne Way, Cheltenham, GL50 3QW - 8 miles. Lloyds Bank, a newsagent, pharmacy, hairdresser, post-office, Indian, Chinese and Fish & Chip takeaways are all within 3 minutes by car. As a productive agricultural area, the Cotswolds is the ideal place to sample local produce and there are many farmers' markets dotted across the region in the various market towns and villages. From locally produced cheese to speciality sausages, there is an extraordinary range of quality food created here. Take a morning out to explore one or more of the wonderful markets listed below. The Stroud farmers' market is one of the biggest and busiest farmers markets in the United Kingdom and is also known for being a bit of a celebrity haunt. While it has been featured by multiple cooking shows and major national publications, it has not lost its authenticity with all produce and crafts gathered or created within a 17-mile radius. It is also multi-award winning, scooping not one but two FARMA awards for Best Farmers' Market and Radio 4's Best Farmers' Market in the country in 2010. The market has between 50 and 55 stalls depending on the season, including Cotswold cheeses, chutneys and preserves, speciality butchers, cooked food stalls, ice cream and certified organic traders. The market also has several special events throughout the year such as the apple day festivities in October, Christmas events in December and the occasional cooking demonstration from local celebrity chef, Robert Rees. Named the best farmers' market in Gloucestershire by Cotswold Life, the Cheltenham market has a variety of stalls offering produce including fruit, vegetables, preserves, cakes, cheeses, free-range meat and plants. In December this bustling market is joined by a 10-day Christmas market offering various crafts and gifts. It was established over 12 years ago and is enthusiastically supported by the local community. Sitting beneath the medieval spires of the Church of St. John the Baptist, this charming market has a range of locally brewed beer, baking, fruit and vegetables, pies and game. All primary produce is grown in the surrounding area and secondary produce must be made locally with at least one ingredient coming from the surrounding area. Regular stallholders include Corinium Ales who recently won Best Farmers' Market Stallholder in the Cotswold Life Food & Drink Awards. There has been a market in this Oxfordshire Cotswolds town since the 13th century and its medieval market square is now also the site of its monthly farmers' market offering fresh, local food from the surrounding area. Stalls offer a variety of produce include baked goods, fruit, vegetables, meat, plants, preserves, honey, plants, beverages and dairy. With between 18 and 20 stalls, this farmers' market is one that offers an array of meat, vegetables, cheese, preserves, cakes and other produce. There are also a range of artisan craft stalls. In addition, most market days include live music giving it a festival vibe. The surrounding town is worth exploring with interesting shops and restaurants. Bathroom 1 En-suite shower room. Family Bathroom Bath with shower over bath. The accommodation is arranged over two floors. Downstairs it comprises two tastefully decorated and comfortable double bedrooms, the master has a shower ensuite and there is a separate bathroom. Upstairs is a spacious contemporary open plan sitting, dining area and fully equipped modern kitchen. The sitting area has a large comfortable corner sofa which can be converted into a double sofa bed if required. There is a log burning stove for cosy winter evenings. For your entertainment, there is a flat screen TV and DVD player, and WiFi system provides you with access to the internet. Dogs welcome (&pound;25 charge per dog). Bigger than expected, really comfy beds and lovely host. Great spot for the weekend. We found this cottage on Bolthole retreats and chose it because of its central location for the people visiting. The property was a few minutes from 2 pubs and only 10 minutes from Cheltenham. 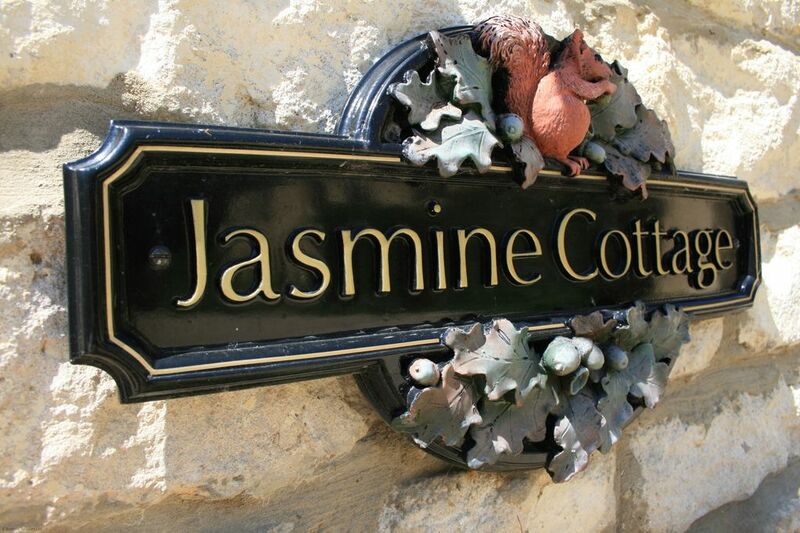 Jasmine cottage is a very comfortable place to stay. The sofa bed is excellent. Our hosts John and Pamela were very welcoming. Beautiful! Great cottage. Friendly owner. Facilities were very nice. Only downside was the traffic noise from nearby road. Its such a lovely place. We came with friends and children and the hosts were very accommodating providing tips and areas we should check out. Renowned for its Regency buildings, including Pitville Pump Room, a remnant of its past as a spa town. There's fine art at The Wilson Museum and the Victorian Everyman Theatre which has an ornate auditorium. It is fabulous or shopping with many well-known high street brands and there are numerous excellent places to eat out. There is a boating lake at Pitville Park which is also a great place for walks, picnics and has an excellent children's play area. Cheltenham is also home to a 1930's outdoor lido. Located in the heart of the Cotswolds, Sudeley Castle & Gardenshas played an important role in England's history for over 1,000 years. Rated amongst the top attractions on TripAdvisor for &lsquo;Things to Do in the Cotswolds', the castle rooms and exhibits contain many fascinating treasures, from ancient Roman times to the present day. Bath Roman Baths, Pump Rooms, Restaurant and Thermal roof-top Spa and swimming pool, Bath is voted as one of the most beautiful destinations in the world and is the only city in Britain to be a designated World Heritage City by UNESCO. Stratford upon Avon a medieval market town, 16thCentury birthplace of Shakespeare, the Royal Shakespeare Theatre and Swan Theatre on the banks of the River Avon performs his plays throughout the year. Cotswold Motor Museum, Motor Museum & Toy Collection. The home of Brum. Admission charged. As always, there is much to look forward to in the season, with 16 exciting days of top class Jump racing. Hundreds of thousands of racing fans come to Cheltenham every year, but you don't need to be an expert to make lasting memories. The wide variety of experiences range from the relaxed feel of the meetings in October and April, to the heady excitement of The November Meeting and the family fun of New Year's Day. However, the focus of any jumping season is always The Festival. The Festival at Cheltenham is the shining jewel in Jump racing's crown. It is four days of magic, magnificence and madness, played out on a stage framed by the breathtaking vista of the Cotswold Hills. It features a cast of the best horses, jockeys and trainers playing to an audience of 260,000 people, all of whom are determined to have the time of their lives. The Everyman is Gloucestershire's theatre - and has been serving the county (and beyond) since 1891. Our main auditorium is an architectural masterpiece designed by Frank Matcham that has inspired generations of performers. The common thread throughout the many years has always been our relationship with our audience - a relationship that we treasure. Visit the Everyman to see ballet, opera, drama, dance, comedy, music events or our traditional family pantomime. There is a full programme throughout the year. A great day out for those who want to see how spirits are made. A fantastic array of activities for young and old. Guaranteed fun for all who have a go. A must day out if you like organic food. Our guests often ask us for recommendations of where to go, so here is a list of places we like to visit venues we like to eat, and some useful information which we hope will enhance your stay with us. Is situated conveniently to Crickley Court, about a 10-minute drive, it is open all day and has a beer garden and play area for children. Dogs are welcome. It has a reputation for its great food, with a kitchen headed by chef Richard Whiting. Please note the discount card in your folder. (Please leave the card when you depart). Situated in the heart of the Cotswolds, the hamlet of Cockleford provides a tranquil and picturesque setting for rest and relaxation. For visitors seeking an alternative to the bland uniformity of many a modern town centre hotel, The Green Dragon Inn offers an appealing individuality - roaring log fires, beamed ceilings and stone flagged floors set the scene for a relaxing experience. Dating from the 17th century, the Inn has proven to be a popular retreat for those appreciating good food, fine wine, real ales. Our bars and furniture have been hand crafted by the famous Robert Thompson - the "Mouse Man of Kilburn". Opened in September 1977 and using only the finest ingredients to create delicious dishes. This has led to praise and fame with appearances on Gordon Ramsey's The F-Word positive testimonials from Richard Branson and Michael Palin. The one and only Curry Corner &ndash; discover the magic behind that little black door. &hellip;fill it up with a generous stock of Cotswolds craft ales, a keg or two of crisp West Country ciders tapped ready to quaff and a good few bottles of a Sommelier's most favoured wine stash. Then, (for the cherry on top) add to the mix a rather delicious serving of country cuisine, some trusty shots of community spirit, armchairs that beg for you to fall into them and six very good-looking bedrooms bursting with soft hues. Although we opened our Simpsons Cheltenham shop in 2009, fish and chips have been in our family for nearly 40 years. We are firm believers that the best fish and chips should consist of good old, no nonsense natural ingredients: fish, potato and batter - that's it! Our batter has no MSG, salt or bulking agents and absolutely no artificial colours or flavouring. With us, you know exactly what you're eating - simply tip top quality fish and chips. Cotswold countryside within an Area of Outstanding Natural Beauty, wonderful walks which forms part of the Cotswolds Way. This beautiful Cotswold countryside, which we manage jointly with the Gloucestershire Wildlife Trust, boasts a wide variety of habitats and plants. The limestone grassland is extremely rich in plants, which in turn support a large variety of insects, especially butterflies. Crickley Hill is a prominent spur of the Cotswold escarpment. It overlooks the Severn Vale, with magnificent views towards Robinswood Hill and May Hill, and the Brecon Beacons and Black Mountain beyond. There's evidence of human activity on the hill going back to 4,000 BC. The area called the Scrubbs takes its name from the brushwood that existed before the planting of the present beech woodland in the 18th century. The 417 Project is the biggest privately-owned mountain bike facility in the country offering a variety of riding disciplines within one venue. The Park and Beach in the Cotswolds offers opportunities for a marvellous family day out &ndash; go to the beach in the country. Try loads of water sports, take on the obstacles in the new WIBIT Aqua Venture, chill out in the new Pizzeria or hire a BBQ pitch!